Unique in focus and content, Strategies In Teaching Anthropology focuses on the “how” of teaching anthropology across all the major sub-fields--Cultural, Biological, Archaeology, and Linguistics--and their two dimensions: research and applied studies. This text provides a wide array of associated learning outcomes and student activities. 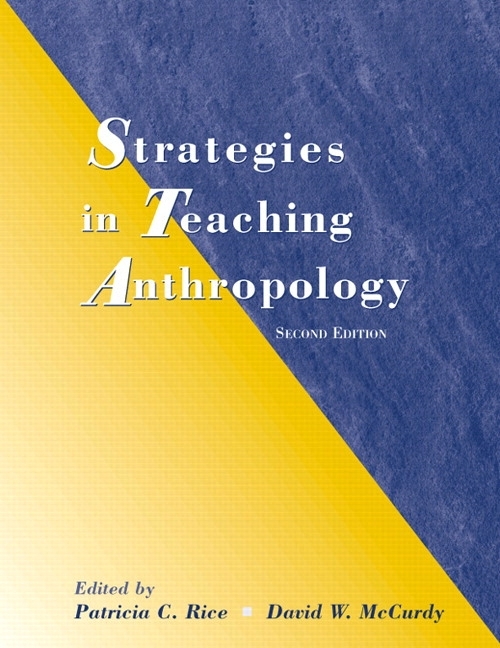 In addition, it is a valuable single-source compendium of strategies and teaching “tricks of the trade” from a group of seasoned teaching anthropologists–-working in a variety of teaching settings-–who share their pedagogical techniques, knowledge, and observations. Focused on the applied, “how to do it” side of teaching, this text is designed to fill the gap between students who are taking an anthropology class for the first time, and instructors who know their subject matter in depth. It helps professors who are not sure how to present anthropological subject matter and processes to their students in a way that will capture and relay their own excitement with the subject. Create a Custom Text: Pearson Custom enables you to work with a dedicated Pearson Custom editor to create your ideal text—publishing your own original content or mixing and matching Pearson content. Contact your Pearson Publisher’s Representative to get started. Teamwork strategies—e.g., joint writing projects. Provides instructors with a broad range of teamwork strategies that are traditional in archaeology and biological anthropology—and a challenge to the lone ethnographer model of cultural anthropology. Such projects, especially those involving teams of two students who are allowed to choose their own partner, enhance the quality of presentation. They require students to get their points across to each other before trying to explain them to the instructor. Better, clearer writing, and higher grades result, along with a sense that even cultural anthropologists can work in teams. Tricks for making comprehensible several of anthropology's “esoteric” topics— e.g., ranging from the potlatch, and economic exchange theory to cross-cousin marriage and moiety organization. Provides instructors with special strategies for parts of the introductory course that students find particularly challenging, such as genetics and kinship. Strategies for demonstrating anthropological perspectives that contradict everyday experience and establish social categories— e.g., teaching about the social construction of race. Teaching tricks ranging from specific to very general applicability. For example, strategies involving interviewing, hypothesis testing, field trips, museum visits, and ethnographic film viewing, can be applied in a variety of courses. Techniques that use the familiar to illustrate the novel. Students appreciate current culture examples, whether studying about kinship, genetics, race, gender, rituals, or values. population goes through the evolutionary processes. … discussion of science and evolution. … depending on topic — race, war, prehistory, etc. share with the rest of the class. different from one’s own, or attempting to identify the function of an artifact. actions will give them prestige. … students use an episode of Friends to guide a discussion on kinship. … using karaoke, students can embody their own gender or deviate into another. ethnocentrism, cultural relativism, and cultural evolution. … students analyze 6 cultural anthropology text covers and discuss findings in class. the collective results are discussed later. involved in discussing its implications. … in groups, students read 4 “stories” and conclude whether they are myths or legends. … students observe primates quantitatively and qualitatively and compare methods. fieldwork to see if one particular cultural complex is authentic or not. artifact and present findings to the class. … through individual and group assignments, students design Wikis. bioanthropologist collecting and then analyzing that data. methods and results using modern equipment. spouses for their kids, and get them married. demonstrate how H. erectus may have made and used fire. … students write memorable class quotes and read them off as a basis for review session. Nacirema bits and the class has to guess what part of American culture it describes. to increase their original allotment. Patricia Rice has taught anthropology for 40 years at West Virginia University where she is an Eberly Distinguished Professor. She has received numerous teaching awards: the American Anthropological Association/Oxford award for Undergraduate Teaching (1998), several West Virginia University Foundation teaching awards, and the Case/Carnegie Professor of the Year for the state of West Virginia (1991). Professor Rice was educated at Ohio State University and the Institute of Archaeology, University College London, and her early field work and publications focused on various aspects of prehistoric art. She currently has several text books with Pearson and has co-edited the six volumes of Strategies in Teaching Anthropology with Pearson. With the other two coeditors of this series, she has conducted Teaching Workshops for the AAA since 2000. She co-edited The Teaching of Anthropology: Problems, Issues, and Decisions (Mayfield 1997) that was based on the American Anthropological Association’s Task Force on teaching, co-edited The Joys of Teaching Anthropology (2007) for McGraw Hill, and co-edits the journal General Anthropology. David McCurdy has been teaching Anthropology at Macalester College since 1966. He has been chair of the department for extended periods since 1969. Professor McCurdy has received numerous teaching awards. He was the first recipient of the American Anthropological Association / Mayfield Award for Undergraduate Teaching (1997). He was also the recipient of the Macalester Distinguished Teaching Award (1995). Indeed he was made the subject of an article in 1977 by Change Magazine for innovative teaching in anthropology, Change, Special Report on Innovative Teaching, No. 6, 1977. Professor McCurdy completed his undergraduate work at Cornell University and received his B.A. in 1957. He finished his Masters in Anthropology from Stanford University in 1959. In 1964, he completed his Ph.D. in Anthropology from Cornell Univeristy. Currently Professor McCurdy’s interests in anthropology include ethnographic research, cognitive anthropology, applied anthropology as well as comparative religion in the United States & South Asia. His research to date consists of a major ethnography (1961-1963), then restudy (1985, 1991, 1994) of a Bhil tribal community in Rajasthan, India. He has also conducted a cross-cultural study of spirit possession (1966-1967). His ethnographic studies has encompassed corporate managers (1983), stockbrokers (1980), Jehovah witnesses (1973), as well as members of an environment movement (1968-1969). He has also performed continued ethnography (1988-1999) on a national motocycle association.